Basil ( UK: /ˈbæzəl/,  US: /ˈbeɪzəl/;  Ocimum basilicum), also called great basil or Saint-Joseph's-wort, is a culinary herb of the family Lamiaceae (mints). Basil is native to tropical regions from central Africa to Southeast Asia. It is a tender plant, and is used in cuisines worldwide. Depending on the species and cultivar, the leaves may taste somewhat like anise, with a strong, pungent, often sweet smell. 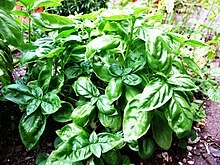 There are many varieties of basil, as well as several related species or hybrids also called basil. The type used commonly as a flavor is typically called sweet basil (or Genovese basil), as opposed to Thai basil (O. basilicum var. thyrsiflora), lemon basil (O. × citriodorum), and holy basil (Ocimum tenuiflorum). While most common varieties of basil are treated as annuals, some are perennial in warm, tropical climates, including holy basil and a cultivar known as " African blue basil". More recently, downy mildew of basil caused by Peronospora belbahrii has been a huge problem for commercial producers and home growers. The disease was first reported in Italy in 2004. It was reported in the U.S. in 2007 and 2008   and has been steadily increasing in prevalence, distribution, and economic importance since then. The most commonly used Mediterranean basil cultivars are "Genovese", "Purple Ruffles", "Mammoth", "Cinnamon", "Lemon", "Globe", and " African Blue". The Chinese also use fresh or dried basils in soups and other foods. In Taiwan, people add fresh basil leaves to thick soups. They also eat fried chicken with deep-fried basil leaves. Basil (most commonly Thai basil) is commonly steeped in cream or milk to create an interesting flavor in ice cream or chocolates (such as truffles). The leaves are not the only part of basil used in culinary applications, the flower buds have a more subtle flavor and they are edible. ^ "British: Basil". Collins Dictionary. n.d. Archived from the original on 29 November 2014. Retrieved 25 September 2014. ^ "American: Basil". Collins Dictionary. n.d. Archived from the original on 29 November 2014. Retrieved 25 September 2014. ^ a b c d e f Simon, James E (23 February 1998). "Basil". Center for New Crops & Plant Products, Department of Horticulture, Purdue University, West Lafayette, IN. Archived from the original on 2 May 2017. Retrieved 22 January 2018. ^ a b "Basil | Diseases and Pests, Description, Uses, Propagation". PlantVillage. Pennsylvania State University. Retrieved 11 April 2019. ^ a b Johnson, B. Christopher; et al. (1999). "Substantial UV-B-mediated induction of essential oils in sweet basil (Ocimum basilicum L.)". Phytochemistry. 51 (4): 507–510. doi: 10.1016/S0031-9422(98)00767-5. ^ Baritaux, O.; Richard, H.; Touche, J.; Derbesy, M.; et al. (1992). "Effects of drying and storage of herbs and spices on the essential oil. Part I. Basil, Ocimum basilicum L.". Flavour and Fragrance Journal. 7 (5): 267–271. doi: 10.1002/ffj.2730070507. ^ Miele, Mariangela; Dondero, R; Ciarallo, G; Mazzei, M; et al. (2001). "Methyleugenol in Ocimum basilicum L. Cv. 'Genovese Gigante'". Journal of Agricultural and Food Chemistry. 49 (1): 517–521. doi: 10.1021/jf000865w. PMID 11170620. ^ "Ocimum minimum information from NPGS/GRIN". ars-grin.gov. Archived from the original on 24 September 2015. ^ "Ocimum africanum Lour. taxonomy detail from NPGS/GRIN". ars-grin.gov. Archived from the original on 13 September 2016. ^ Fandohan, P.; Gnonlonfin, B; Laleye, A; Gbenou, JD; Darboux, R; Moudachirou, M; et al. (2008). "Toxicity and gastric tolerance of essential oils from Cymbopogon citratus, Ocimum gratissimum and Ocimum basilicum in Wistar rats". Food and Chemical Toxicology. 46 (7): 2493–2497. doi: 10.1016/j.fct.2008.04.006. PMID 18511170. ^ Pessoa, L. M.; Morais, SM; Bevilaqua, CM; Luciano, JH (2002). "Anthelmintic activity of essential oil of Ocimum gratissimum Linn. and eugenol against Haemonchus contortus". Veterinary Parasitology. 109 (1–2): 59–63. doi: 10.1016/S0304-4017(02)00253-4. PMID 12383625. ^ a b "Basil". Etymology Online, Douglas Harper. 2018. Archived from the original on 25 October 2012. ^ Bomford, Michael (May 2009). "Do Tomatoes Love Basil but Hate Brussels Sprouts? Competition and Land-Use Efficiency of Popularly Recommended and Discouraged Crop Mixtures in Biointensive Agriculture Systems". Journal of Sustainable Agriculture. 33 (4): 396–417. doi: 10.1080/10440040902835001. Archived from the original on 18 September 2016. Retrieved 17 September 2016. ^ Maurya, Prejwltta; Sharma, Preeti; Mohan, Lalit; Batabyal, Lata; Srivastava, C.N. ; et al. (2009). "Evaluation of the toxicity of different phytoextracts of Ocimum basilicum against Anopheles stephensi and Culex quinquefasciatus". Journal of Asia-Pacific Entomology. 12 (2): 113–115. doi: 10.1016/j.aspen.2009.02.004. ^ "Blessing of the Waters known as Agiasmos conducted by a Greek Orthodox priest". Archived from the original on 7 March 2012. Retrieved 10 September 2012.